We’re reaching the height of the winter holiday season, and at this point many of us are feeling a little frazzled, a little harried, and more than a little ready for things to slow down. I don’t know about you, but the more effort I make to stay grounded, the more able I am to fully experience the meaning and warmth of this season. For me, staying grounded means getting enough sleep, spending time on my yoga mat, and soulful, simple cooking. 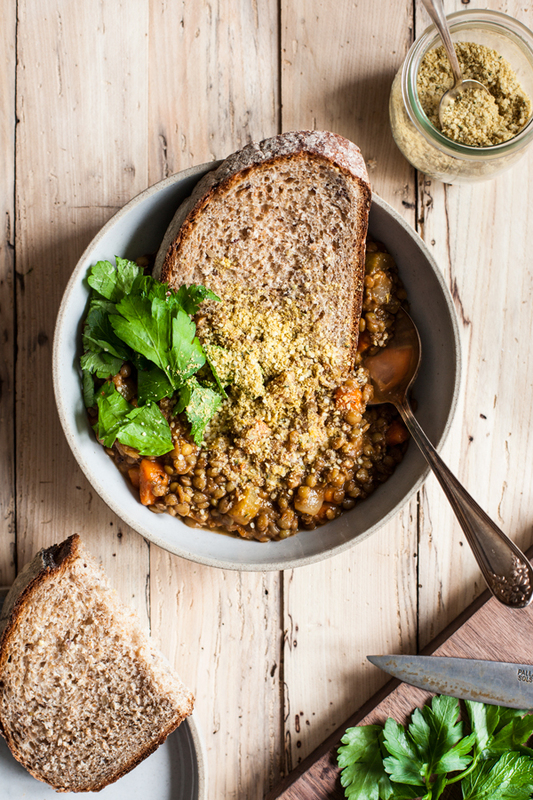 This simple French lentil soup is exactly the kind of recipe I crave at this time of year: a hearty, grounding, nourishing meal that demands little more than some hands-off simmering. The recipe is so simple that it barely necessitates a formal recipe. 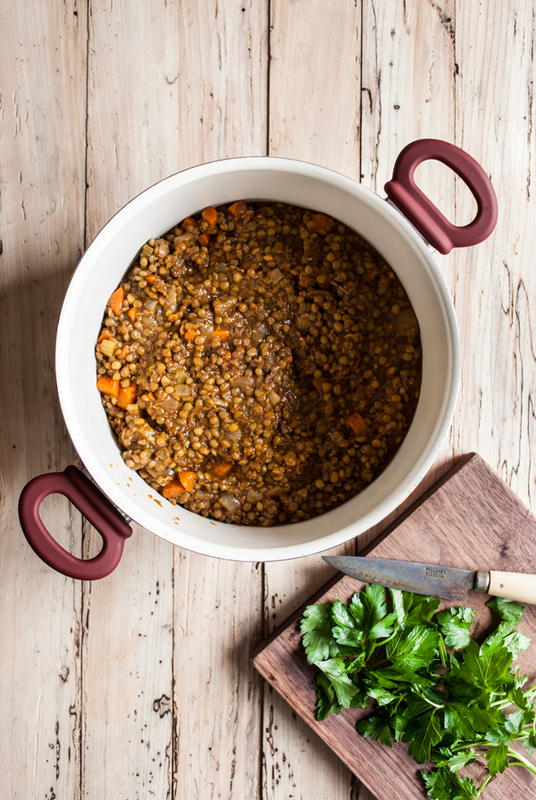 The measurements don’t have to be precise, as long as you use about a quart of broth or water for every cup of lentils. Other than that, you begin by sautéing some onion, carrots, celery, and garlic. 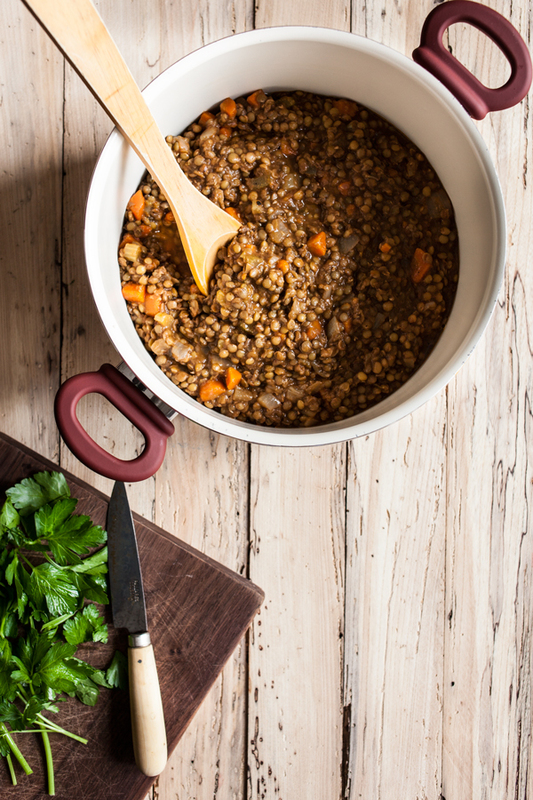 You add lentils, liquid, and the herbs and seasonings you have. You can finish the soup with a splash of vinegar, a drizzle of olive oil, or–if you’re feeling a little fancy–some sherry. That’s it. Other additions, such as leafy greens, won’t hurt. Neither will crushed or diced tomatoes, curry powder, vegan yogurt, lemon juice or zest, or a host of other optional additions. 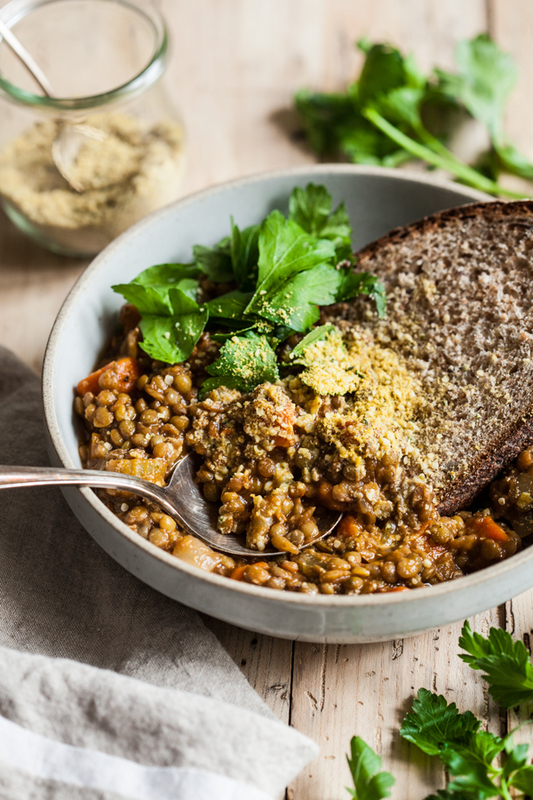 But no matter how you choose to play with the recipe over time, the backbone can remain the same: vegetables, lentils, stock, herbs, and time. 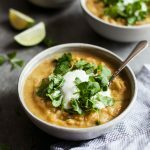 One of my challenges with lentil soup in the past has been that lentils can get stuck to the bottom of a soup pot; this is truest for red lentils, at least in my experience, but it can happen with any lentil, not to mention split peas (another favorite legume). 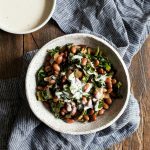 When I made a pot of this soup last night, I used my GreenLife cookware 5-quart covered stockpot. I love using this pot for soups and stews: it’s durable, light (which means it’s easy to store and move around the kitchen as needed), and I love the deep burgundy color! No sticking means no scrubbing or soaking after cooking. An easy cooking process and minimal cleanup are just a few reasons that I love my cookware from GreenLife. I also love that the brand is budget-friendly and on a mission to help introduce cooks of all ages and experience levels to the fun of cooking. 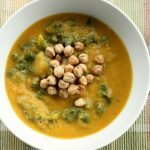 If you’re just starting to build your own kitchen repertoire, this soup is an accessible and rewarding recipe to start with. Heat the olive oil in a medium pot over medium heat. Add the onion, carrot, and celery. Saute, stirring frequently, for 5-7 minutes, or until the carrots are tender and the onion is soft and clear. Add the garlic and cook for 2 more minutes, stirring constantly. Add the tomato paste, lentils, broth, bay leaf, thyme, salt, and pepper to the pot. Bring the mixture to a boil. Reduce the heat to low, cover, and simmer the soup for 45 minutes. 5 minutes before the soup is ready, you can add the sherry and finish simmering the soup uncovered. You can also add baby spinach or chopped greens, stir them into the soup, and simmer uncovered for the final 5 minutes of cooking time. Add the vinegar or lemon juice to the soup. Taste and adjust seasonings as needed. If you’d like the soup to be thinner, add a bit of water to the pot. Serve with a slice of toast and some vegan parmesan, my hempesan, or nutritional yeast, if desired. 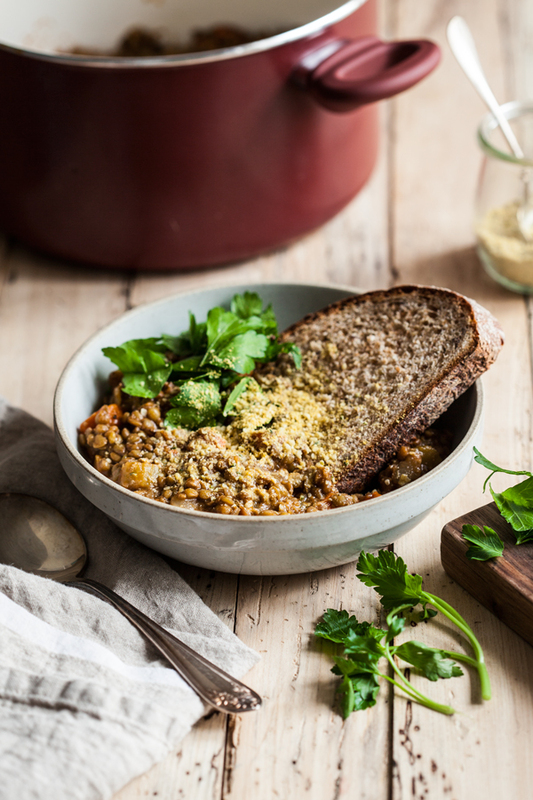 Leftover soup will keep in an airtight container in the fridge for up to 5 days. It can be frozen for up to 1 month. 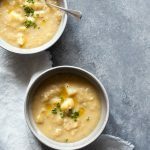 This soup can be easily doubled to serve a crowd, or you can double it in order to freeze some (I made a double batch yesterday so that I could freeze individual servings for quick, easy lunches). And you can certainly get creative with herbs and seasonings; I’ve added rosemary, celery seed, shallots, and oregano in the past. As with most soups, the leftovers will only become more flavorful after a couple days, and the soup will thicken in the fridge, too. This gives you the option of serving it as a dense, scoopable accompaniment to toast, or thinning it out and enjoying in a more soupy form. It’s all up to you: what matters is that the soup warms you up, fills your belly, and makes you feel grounded. That, at least, is what it always does for me. Enjoy the recipe. This post is sponsored by the GreenLife brand. All opinions are my own, and I love this nonstick cookware. You can learn more about GreenLife products, purchase online, or find GreenLife near you here. Thanks for your support! Oh thanks so much for this. I just went vegan a few weeks ago and am always looking for new recipes, and I bought a huge bag of carrots today. So…I’ll be making this for dinner tonight 🙂 Looks lovely. And great blog, btw. That looks so good, I’ll have to try it out! 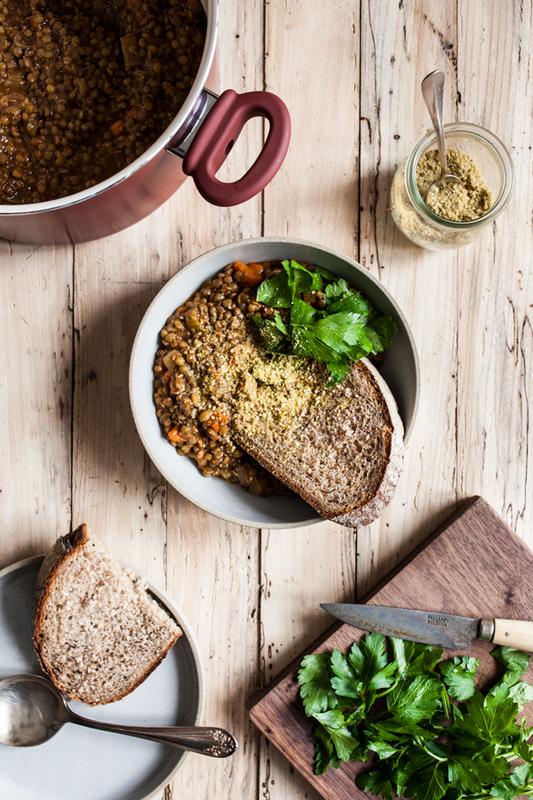 I remember when I was skint in Colombia i would eat a ton of lentil soup…may have to get back on it! Lentil soup is my favorite. I love your suggestion of adding sherry to it- just what I need for the winter. Looks so delicious! And that parmesan + bread on top make this look even better! We made this last night! 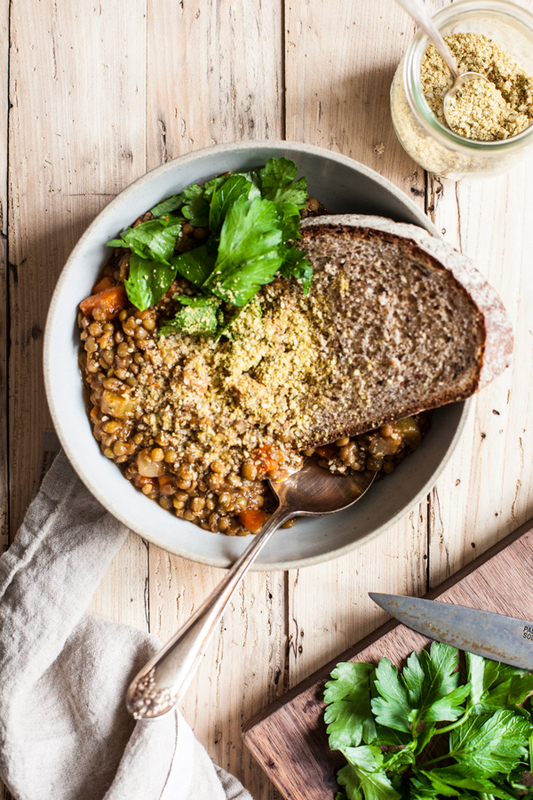 Deliciously hearty but super simple. I’m a big fan of the “just throw it in” recipe method and like a fair big of variation so this is perfect. Thanks so much! DELICIOUS! Muy flavorful and filling! This looks delicious! I do have one question, is the optional ¼ cup sherry..more vinegar or sherry wine? Thanks! I made this recipe this Monday and let is sit in the fridge till Wednesday evening. Amazing! So simple and so flavorful. I did switch it up a bit and added a full head of dino kale, a bit more liquid, and topped it with a sprinkle of feta. So good! I will be making this again.